William S. Hart (and Lousie Glaum?) in "The Disciple," 1915. Thomas Ince, producer. Magic lantern slide (used as a trailer). Produced by the Triangle Film Corporation under the supervision of Thomas H. Ince; distributed by Triangle (Kay-Bee Ince brand); in production May 27-July 2, 1915; released November 21, 1915; © November 1, 1915; production cost, $8,356.12; five reels. 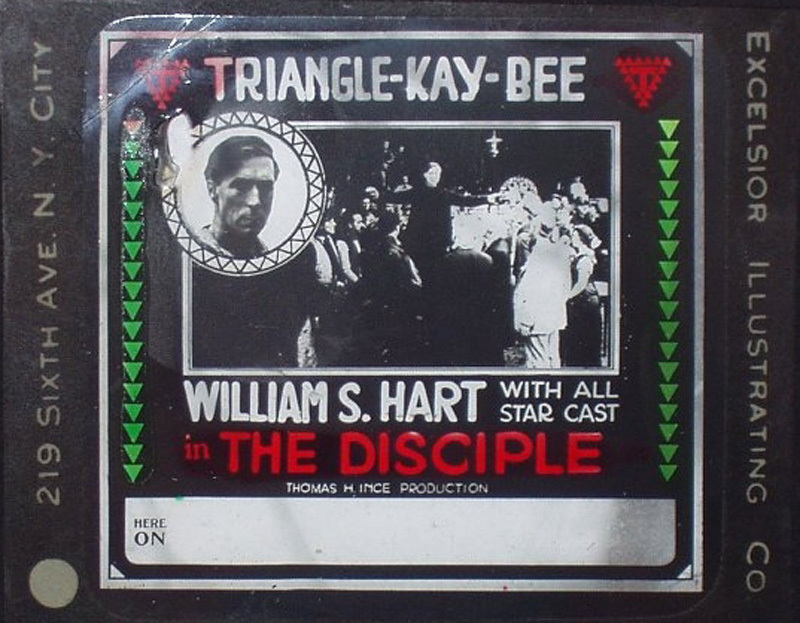 Directed by William S. Hart; story and screenplay by S. Barret McCormick and Thomas H. Ince; photographed by Joe August; original score by Wedgwood Nowell. CAST: William S. Hart (Jim Houston); Dorothy Dalton (Mary Houston); Thelma Salter (Alice Houston); Robert McKim ("Doc" Hardy); Charles K. French ("Birdshot" Bivens); Jean Hersholt (an extra). SYNOPSIS: Jim Houston, the "Shootin' Iron Parson," comes to Barren Gulch to reform the morals of the frontier community. He receives the support of "Birdshot" Bivens, the sheriff of the county. Jim's wife, Mary, however, is a weak character. She falls a prey to the seduction of "Doc" Hardy, the village gambler and saloon keeper, and elopes with him. Jim Houston, forsaking the ministry, goes to the mountains and cares for his child in a log cabin home. LW2174: 19200 dpi jpeg from 72 dpi jpeg.